Amateur, passionate or day adventurer, follow us and discover with us the world of free flight.. Tandem flight, course, voucher gift, you will find here the flight which suits you. Then enter and let be guided in this paradise of free flight. From simple first flight to the internship several days for your Annecy paragliding, discover all our proposals paraglider flight in an exceptional setting in Annecy. 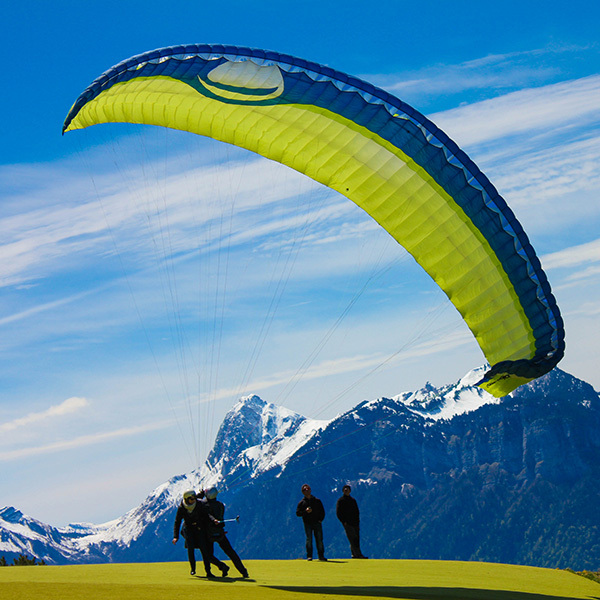 Discover the paragliding through our various offers of baptism. Learn about the paragliding solo with our internships according to your level. Offer a unique and unforgettable adventure to your close friends for a flight over the Lake Annecy. [vc_toggle title=”Do we have vertigo while paragliding ?”]Rest assured, you can not have vertigo in flight, because it is not grounded. This is an amazing and soft feel, we see some landscape as a photo. As an airplane, we can possibly have a little scared at first, but no vertigo. [/vc_toggle][vc_toggle title=”How is the take off in paragliding ?”]First your instructor will explain the takeoff instructions: Simply walk and not stop. Then the sail starts to take you in the air. In any case you will have the sensation of falling ! [vc_toggle title=”And once in the air ?”]Once in the air under the paragliding, you will just have to sit down in your stand and to let you carry! In the air you will sit a little as on a swing with a file. Once comfortably installed, appreciate your flight, and if you wish we can even make you pilot a moment!! Just enjoy the beautoful view of lake annecy ! [/vc_toggle][vc_toggle title=”Are we airsick in paragliding ?”]Very few people are subject to air sickness! (about 5%). These are people who are also very susceptible to seasickness or behind cars. In this case take a first flight discovery, no one is sick for 20 minutes. 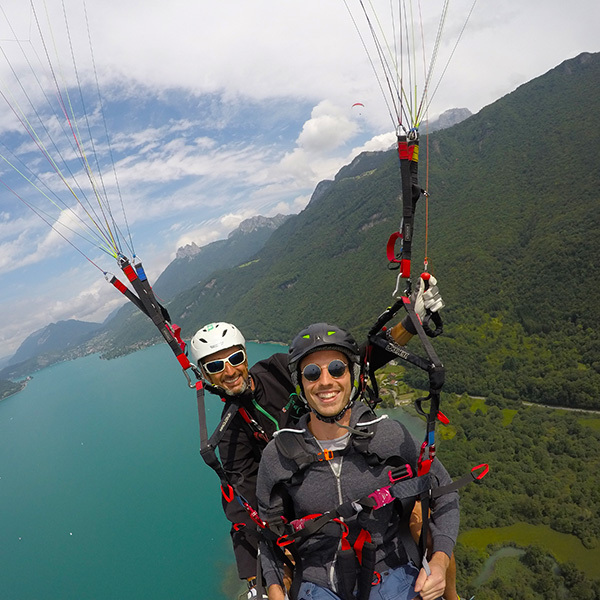 [/vc_toggle][vc_toggle title=”Why choosing paragliding Annecy ?”]Site Forclaz-Montmin is one of the most famous sites in the world for free flight. Winds and reliefs are very favorable to our activity and the view is unique: you will fly over the lake, the take-off and landing area are perfect! It is a magical site, a perfect place to discover paragliding Annecy !! [/vc_toggle][vc_toggle title=”How should you wear for your paragliding jump ?”]Summer : Even if it’s hot on the ground, in the air things are different. We fly about 45 km/h and it is not rare that we reach altitudes from 2 000 to 2 500 m. So get yourself a sweatshirt and a warm windbreaker and long pants. We also recommend you wear good walking shoes (in order to avoid possible sprains). No shoes with smooth soles, or flip flops ! A question about Paragliding Annecy? Write us !